Buy 3 value refills, Get 1 FREE! Buy 1 starter kit, Get 1 syringe refill FREE! Highly esthetic composite restorative material with a bioactive resin matrix that actively releases and exchanges calcium, phosphate and fluoride ions. Glass filler mimics the physical and chemical properties of natural teeth. Due to the high viscosity of the material, an Activa-Spenser™ dispensing gun (included in the starter kits) is required. 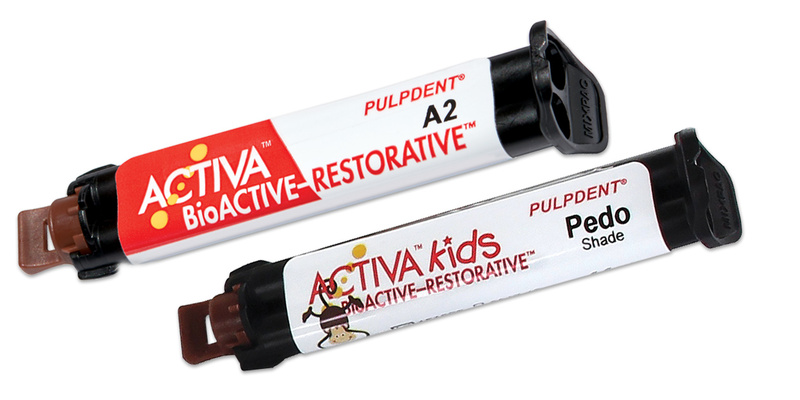 Click here to see 11 uses of Activa for successful long-term restorations. Contains: 1 x 5ml syringe, 1 Activa-Spenser dispenser gun, 20 automix tips with bendable 20 ga. metal cannula. Contains: 1 x 5ml syringe, 20 automix tips with bendable 20 ga. metal cannula. Contains: 2 x 5ml syringes, 40 automix tips with bendable 20 ga. metal cannula. Bioactive restorative materials are relatively new in dentistry. They are restoratives that are moisture friendly, transport water, and stimulate apatite formation at the material-tooth interface. In addition, these resins react to pH changes in the mouth by releasing and up-taking calcium, phosphate and fluoride ions, thus helping to maintain the chemical integrity of tooth structure. The first generation of this class of composites can be placed with or without a bonding agent and is delivered via a dual-barrel, automix syringe. A total of 194 anterior and posterior Activa BioActive-Restorative restorations were originally placed and 158 of these restorations were recalled at two years. 76% of the restorations were placed with the use of bonding agent after etching, and 24% were placed without bonding agent after etching. 27% of restorations were on 1 surface, 49% on 2 surfaces, 22% on 3 surfaces and 2% on 4 surfaces. Lack of Postoperative Sensitivity: After initial placement, only a few patients reported some sensitivity, which subsided over time. At the 2-year recall, no patients reported any postoperative sensitivity. Esthetics: The esthetics of the restorations was excellent. 96% of the recalled 158 restorations received a rating of 5, while 3 received a rating of 4, and 3 a rating of 3. Lower ratings usually were the result of slight staining and discoloration. None of these restorations needed replacement. Resistance to Marginal Discoloration: Resistance to marginal discoloration was also excellent. Only 4 out of the 158 restorations received a rating of less than 5. 2 had a rating of 4 and 2 others had a rating of 3. Wear Resistance: 99% of the restorations exhibited no signs of wear. Only 2 of the recalled restorations exhibited slight wear. Retention: Retention was excellent. One restoration out of the 158 partially debonded and was replaced. Activa BioActive-Restorative performed extremely well at the 2-year recall. Each evaluated category received a 96% or better rating. Overall Activa BioActive-Restorative received a clinical performance rating of 98% at the two-year recall. Smart/bioactive properties are appealing. This includes fluoride release and recharging. Most of its physical properties, which we did not measure, such as compressive strength, diametral tensile strength, flexural strength, and fracture toughness, are impressive. Its depth of cure and low shrinkage indicate it can be used in bulk fill situations 4mm or less and even if you exceed this thickness, its self-cured mode will ensure it is thoroughly cured. No BIS-GMA or Bisphenol A. Relative lack of hardness. Dual-cured character means you probably need to use a new mixing tip if you are going to layer it in a deep prep. Flowable consistency doesn''t allow any sculpting. Ambiguity concerning the use of a bonding agent. Self-cured mode is slower than claimed. Fluorescence is poor. Enamel-like gloss is hard to achieve. Esthetics is not exemplary. Could be a game-changing type of restorative material, especially for those patients with a high caries rate, but its lack of sculptability and mediocre esthetics may limit its widespread acceptance until its clinical superiority is validated. Activa Bioactive-Restorative earned 4.2 stars out of a possible 5.0.